(I am very grateful to Paul Anderson for the following text). When an old mountaineering friend fell gravely ill, Andy Miller found himself looking for solace in the oldest of a set of personal diaries that he had faithfully maintained for fifty years. Would their youthful adventures be recorded? What shared memories had he forgotten? Was there an anecdote or two that might help lift his stricken friend? Long-forgotten rock climbs and hitchhiking adventures tumbled out from the pages as he found himself immersed in the experimentation and freedom of his 1960s youth. As it dawned on him that the shelves of dusty notebooks literally contained the story of his life, questions started to crowd the mind of this nationally-recognized psychologist and award-winning poet. Why do people write personal diaries? Who, if anybody, do they think will be interested in them? Jolted by his friend’s condition he decided it was time to face his own past; time at last to read and edit them all. So began a journey not only into his own life story but into the role of diaries in our lives and, ultimately, into the very nature of human memory and the sense of the self. Andy Miller is an Honorary Professor at the Universities of Nottingham and Warwick. 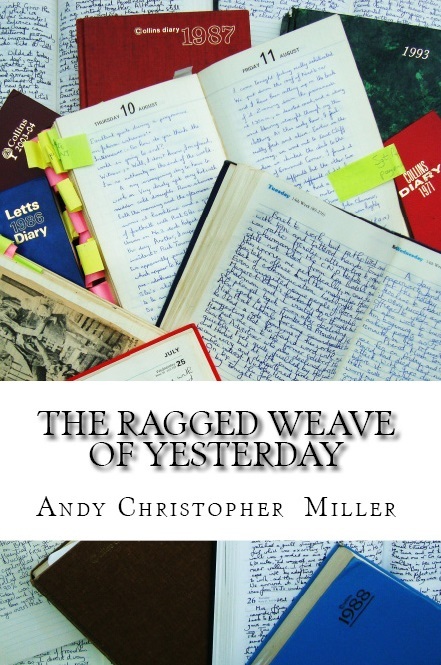 These words beautifully encapsulate the essence of, The Ragged Weave of Yesterday by Andy Miller, of which I’ve been delighted to have the chance to read in advance of its publication.